Don't be fooled by the name "Nougat Ice Cream"--this is not a candy! Instead, it's a smooth, creamy ice cream with the traditional flavors and ingredient profile of nougat. So if you love the classic almond-and-honey combination of nougat or Torrone, then this ice cream is for you! Unlike many ice cream recipes that use milk and egg yolks, this recipe is similar to nougat recipes and calls for egg whites and a honey-sugar syrup. Because it uses whites instead of yolks, it's not as heavy as some ice creams, so it feels light and refreshing. 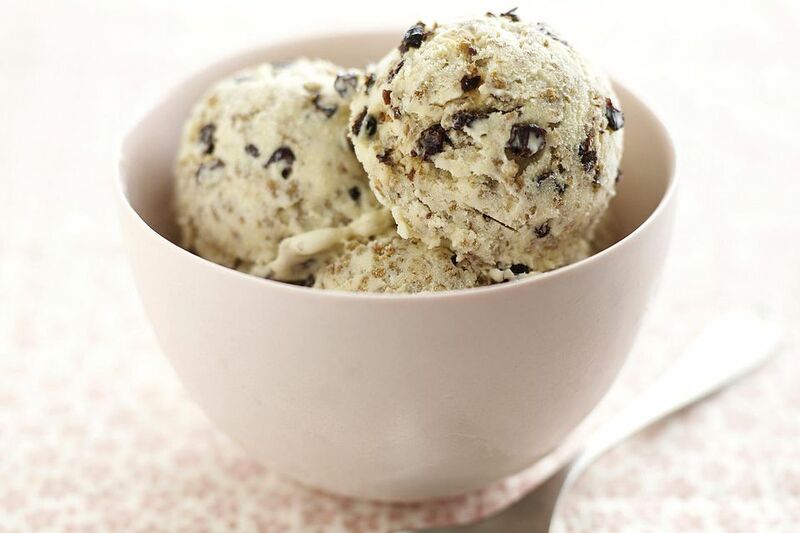 The best part is, there is no ice cream maker required! I added some chopped chocolate to this recipe because I love the combination of almonds and chocolate, but you can experiment and try adding different nuts, white chocolate, or dried fruits like cranberries or cherries. Just like with many ice cream recipes, it's infinitely flexible! Combine the cream with the almond and vanilla extracts in a medium bowl, and beat the cream until it is thick and holds peaks. Place the whipped cream in the refrigerator while you prepare the rest of the recipe. Place the egg whites in a large clean bowl of a stand mixer fitted with a whisk attachment. Alternately, you can place the egg whites in a large bowl and use a hand mixer fitted with whisks. Beat the egg whites until soft peaks form. While the egg whites are beating, combine the honey, sugar, and water in a small saucepan over medium heat and stir until the sugar dissolves. Bring the mixture to a boil, and once it is boiling, keep it at a boil it for two minutes. After two minutes, remove the honey syrup from the heat and, while the mixer is running, slowly pour the hot syrup into the egg whites in a steady stream. You can transfer the mixture to a measuring cup with a spout to make it easier to pour, if desired. After all of the syrup has been poured into the whites, raise the speed to medium-high and continue to beat the mixture until it has cooled to room temperature, about 5-7 minutes. Once the mixture has cooled, fold in the whipped cream, chopped nuts, and chopped chocolate. Scrape the ice cream mixture into an airtight plastic container or other freezer-proof container, and place it in the freezer to firm up, for at least 4 hours or overnight. Once firm, scoop the ice cream and enjoy! Make Your Own Torrone (Almond Honey Nougat) At Home! Ice Cream Fudge Recipe - Made With Real Ice Cream!